Not Pigeon. Not Piggie and Elephant. Not Knuffle Bunny. A wily fox, a plump goose and baby goslings. School Library Journal describes the book perfectly: "theatre of the lap". 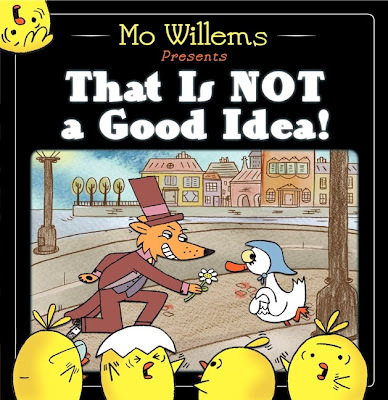 Mo Willems has created a turn-the-page silent movie -- with its own not-so-silent Greek chorus of goslings. 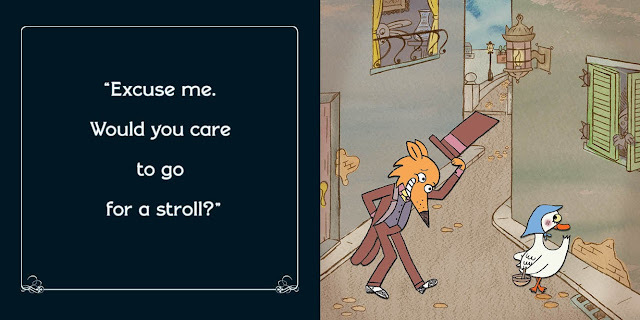 The story line is carried by silent movie style cards. You can almost hear the piano playing in the background! 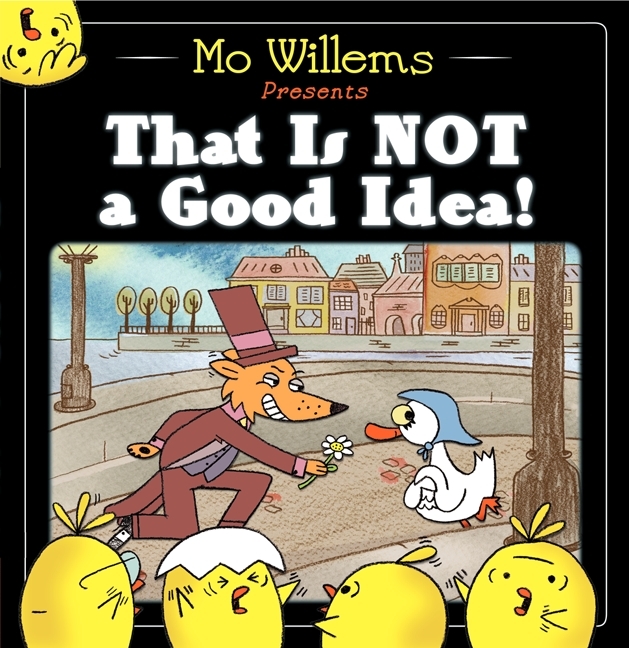 Accompanied by the typically simple-but-ever-so-informing Mo Willems illustrations. An increasing number of goslings try and warn someone, with increasing intensity, that something is not a good idea. I'm not going to tell you who someone is, or if they listen. But I will let it slip that there is a surprise twist at the end. And no feathers on the floor. There are a bunch of good idea activiites on the Harper Collins website - all ready to download, print and enjoy. 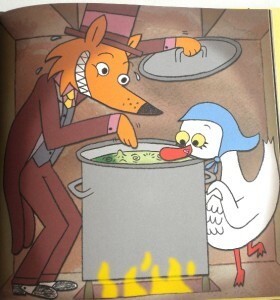 I know the kids will enjoy tossing a wily fox beanbag into a pot. (bottom left). And the goslings. There is a gosling to decorate and create a personality (bottom right) for. 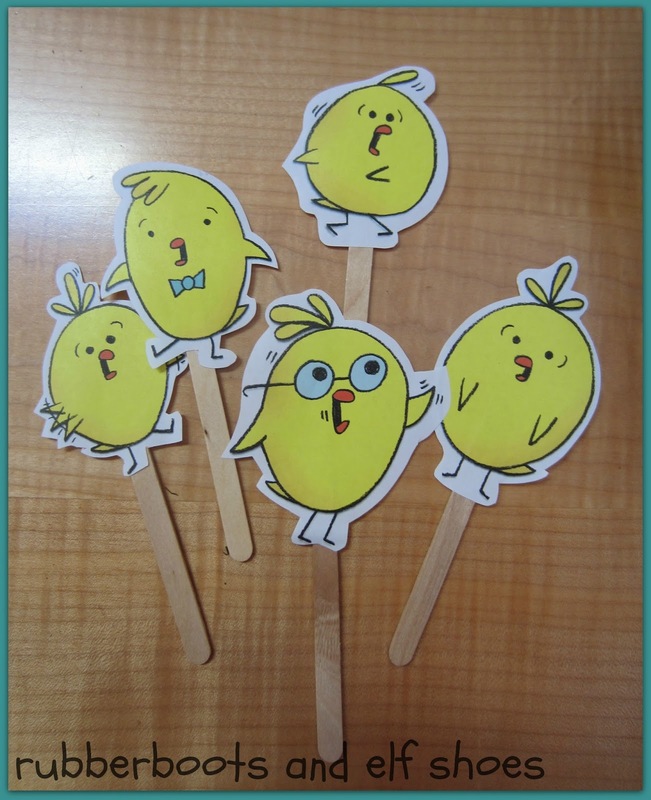 Mo Willems suggests that kids make gosling finger puppets (top middle) to tell people that something is a good idea (going for ice cream) or that something is not a good idea (eating too much ice cream). The style of the book (theatre of the lap) begs to be copied. 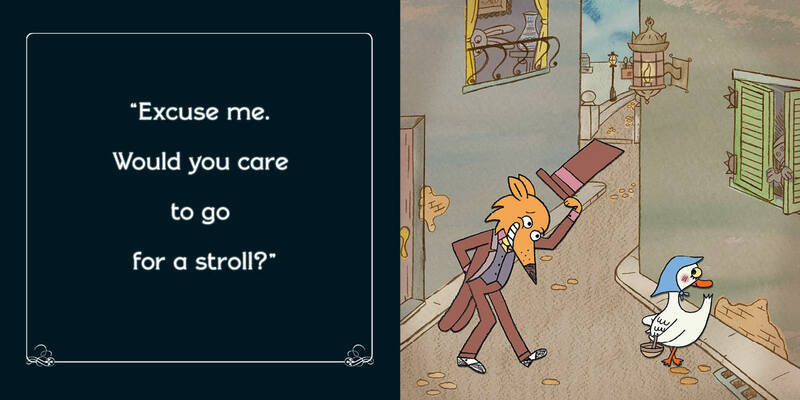 I'm thinking it would be loads of fun to either draw pictures for a story - or even more fun - take pictures with the iPad/digital camera - and print the silent film style caption on black paper. It is also a perfect book for reader's theatre. I want to be a gosling! Check out the book trailer. If nothing else sells you on That is Not a Good Idea, it will. Love Mo Willams and love this book recommendation! You're right...you could do so much with it. Thanks for linking up! I'm off to Amazon to update my wish list!! I love Mo Willems stuff. I am going to have to go back to the archives and find out what Sesame Street stuff he won award for - and watch it! Love , thanks for sharing Sandi ! It is my pleasure to share a wonderful book. Thank you for linking up again this week! 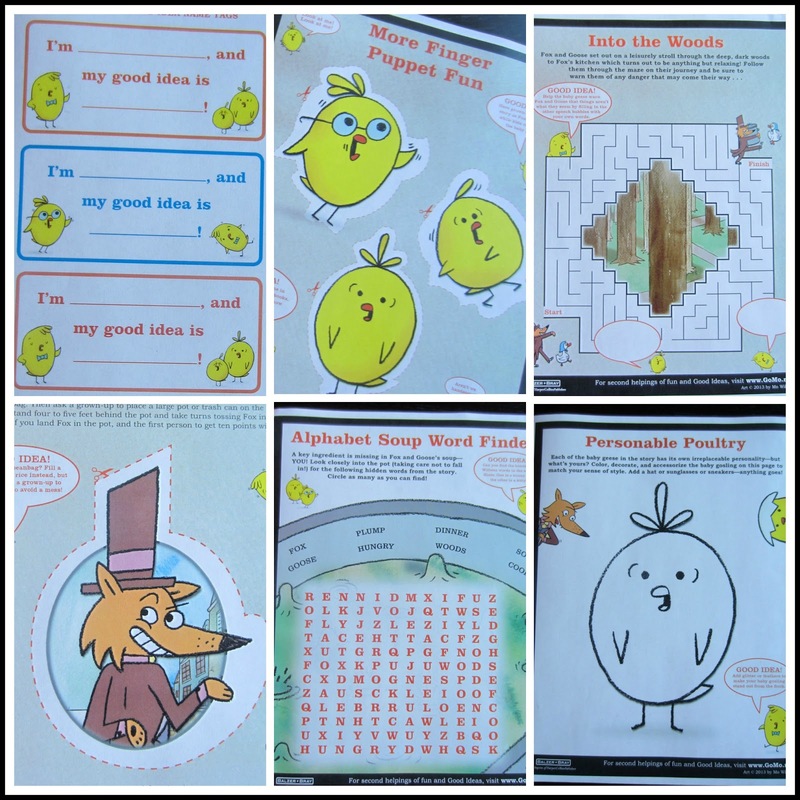 I love Mo Willems and will have to go find this book and purchase it!!! So cute with so many fun ideas!! I bought this book from the book store in Duncan. :) I love it! 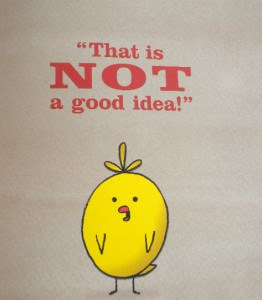 Mo Willems is a genius. I've heard of this book but haven't purchased yet. Now I will! Thanks, Sandi. Genius indeed! This one looks great! Will have to check it out!